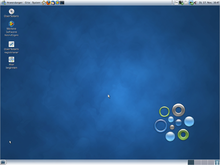 As of 2012[update], the Unix market is divided between five System V variants: IBM's AIX, Hewlett-Packard's HP-UX, Oracle's Solaris, Xinuos's UnixWare and illumos distributions being the open-source OpenSolaris continuation. ^ a b "The Last Days of Unix". Network World. 19 August 2013. Retrieved 26 Jun 2014. ^ "Whither OpenSolaris? Illumos Takes Up the Mantle". Archived from the original on 26 September 2015. ^ a b Lévénez, Éric. "Unix History (Unix Timeline)". Archived from the original on 2010-12-29. Retrieved 2010-12-29. 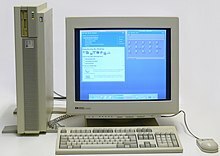 ^ Overview of the XENIX 286 Operating System (PDF). Intel Corporation. November 1984. p. 1.10. There was no System IV. ^ Dale Dejager (1984-01-16). "UNIX History". 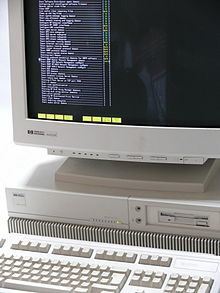 Newsgroup: net.unix. ^ Tanenbaum, Andrew S. (2001). Modern Operating Systems (2nd ed.). Upper Saddle River, NJ: Prentice Hall. p. 675. ISBN 0-13-031358-0. Whatever happened to System IV is one of the great unsolved mysteries of computer science. ^ a b c Kerrisk, Michael (2010). The Linux Programming Interface. No Starch Press. p. 921. ^ "UNIX System V and add on applications prices" (PDF). AT&T International. 24 February 1983. Retrieved 27 April 2014. ^ a b Kenneth H. Rosen (1999). UNIX: The Complete Reference. McGraw-Hill Professional. ^ Jeff Tye (10 July 1989). 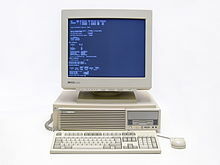 Other OSs That Run Unix on a 386. InfoWorld. p. 62. ISSN 0199-6649. ^ "SEVERAL MAJOR COMPUTER AND SOFTWARE COMPANIES ANNOUNCE STRATEGIC COMMITMENT TO AT&T'S UNIX SYSTEM V, RELEASE 4.0" (Press release). Amdahl, Control Data Corporation, et al. October 18, 1988. Retrieved 2007-01-01. ^ John R. Levine (1999). Linkers and Loaders. Morgan Kaufmann. ^ Eric S. Raymond, A buyer's guide to UNIX versions for PC-clone hardware, posted to Usenet November 16, 1994. ^ William Fellows (13 August 1992). "Unix International reviews the Unix System V.4 story so far". Computer Business Review. Retrieved 2008-10-31. ^ Eric S. Raymond (16 November 1994). "PC-clone UNIX Software Buyer's Guide". Retrieved 6 May 2014. ^ Eric S. Raymond (16 November 1994). "PC-clone UNIX Software Buyer's Guide". Retrieved 3 February 2014. ^ Vinod Valloppillil (11 August 1998). "Open Source Software: A (New?) Development Methodology". Retrieved 3 February 2014. ^ a b c Tom Yager (19 November 2001). "Vital Signs for Unix". Computerworld. Retrieved 5 June 2015. ^ "TOP500 Supercomputer Sites - List Statistics". Retrieved 28 January 2016. ^ Patrick Thibodeau (12 December 2013). "As Unix fades away from data centers, it's unclear what's next". Retrieved 6 June 2015. This page was last edited on 3 April 2019, at 05:42 (UTC).